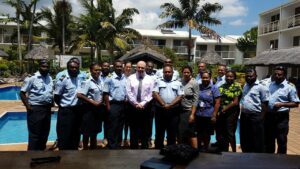 The OCO in partnership with the Centre for Customs and Excise Studies, Charles Sturt University (CCES) and the Vanuatu Customs and Inland Revenue Department (VCIR) organized a PACER Plus Rules of Origin (ROO) Workshop from 19-20 November, 2018 in Port Vila, Vanuatu. 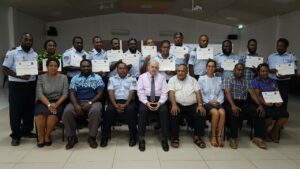 The workshop was held under the auspices of the OCO PACER Plus Readiness Package and involved sixteen local Customs Officials undertaking a course of study in ROO. Apart from the workshop the trainees will also be undertaking a month’s online study of the PACER Plus ROO. Importantly the national Workshop was led by local pre-accredited PACER Plus ROO Trainers who had themselves participated in a three month training program comprising attendance at a Train the Trainer course, six weeks of online study on the ROO chapters within the PACER Plus Agreement and participation in a week long PACER Plus ROO workshop in Canberra. The national workshop is the final part of their assessment for qualification as an “OCO ROO Trainers.” Following qualification, the “OCO ROO Trainers” will be able to deliver ROO Training for public and private sector stakeholders across the region; the aim being creating awareness on ROO to enable stakeholders to benefit from opportunities provided by the PACER Plus Agreement. Topics discussed during the national Workshop included Overview of ROO, Impacts of ROO on Trade, ROO criteria and verification procedures under Chapter 3 of PACER Plus Agreement. The participants participated in workshop exercises and also shared information and experiences on ROO application. 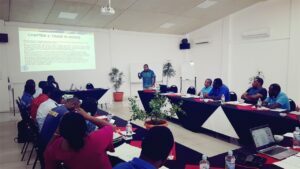 Following the Vanuatu Workshop, national PACER Plus ROO Workshops will be conducted in the other PACER Plus signatory countries in the months of November 2018 to February 2019.